Women’s only beginners Brazilian Jiu Jitsu classes are going to be starting at Stealth BJJ in July. This will be a great addition to the timetable and hopefully encourage women in Manchester and the surrounding areas to get involved in this amazing Martial Art. The classes will be every Tuesday evening from 7-8pm and will cover the fundamentals of Brazilian Jiu Jitsu from a self defense perspective. The class will be run by Stealth BJJ purple belt Vicki Harold. Vicki has been training for around 6 years and is really excited to be starting the classes and is sure it’ll help bring more women into Jiu Jitsu. There are a multitude of benefits to training Jiu Jitsu. Anyone can start this class and you certainly don’t have to go to the gym and get fitter before starting. The classes are very progressive and you can go at your own pace. It is a great way to slowly build strength and also work on your aerobic fitness. The self defense aspect of the lesson is the key to Brazilian Jiu Jitsu though. It is an amazing martial art for dealing with escaping and surviving from bad positions and reversing this to your advantage with joint manipulation techniques and chokes. The whole foundation of the art is to be able to defend/survive against a much stronger and larger opponent. Over the last few years there has been a massive increase in the number of women training at the club. There are now around 20 women who train in the mixed classes at the Stealth BJJ ranging from white belts through to purple. 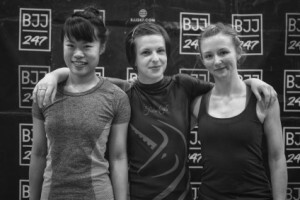 We believe that the womens only beginners class will help encourage more women to train and get involved in Jiu Jitsu. It is a daunting experience walking into any gym for the first time. Our goal with this additional class is make that first step easier and show what a fun and welcoming environment we have at the club. Just email, message, phone or facebook message us to book in for a free trial class.